Best Paper Award, atorgat pel Organizing Committee del CoDIT'17 Inland navigation networks are composed of several artificial canals that are characterized by no slope. These canals are particularly subject to resonance phenomena, which can create waves such that the navigation condition might not be guaranteed. It is therefore required to ensure dealing with freefault measured data and actuators. In this work, a fault detection and isolation method based on the Integrator Delay Zero model (IDZ) is designed for flat navigation canals. The proposed method is dedicated to the detection and isolation of sensor and actuator faults. It is tested by considering the Cuinchy-Fontinettes canal located in the north of France. 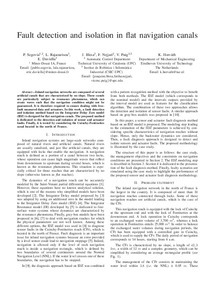 Segovia, P., Blesa, J., Horvath, K., Rajaoarisoa, L.H., Nejjari, F., Puig, V., Duviella, E. Fault detection and isolation in flat navigation canals. A: 4th International Conference on Control, Decision and Information Technologies. "4th-2017 International Conference on Control, Decision and Information Technologies". Barcelona: 2017, p. 1-6.